here’s nothing like a good old fashioned rustic country wedding. It’s down to earth, simple, chic, and totally cute. But trying to nail the theme perfectly can be a bit overwhelming! We’re here to make things easier. We’ve come up with a must-have list of 20 GORGEOUS rustic country wedding ideas that you will need to create the PERFECT night! There are few things more country rustic than a Ford pickup truck. That being said, check with one of your buddies to see if you can borrow their truck for the night. The bride can drive there with her Father for the wedding, or you can just use it to take adorable wedding photos like the one you see here. I mean, that picture is about as country as it gets- and it’s unbelievably cute. 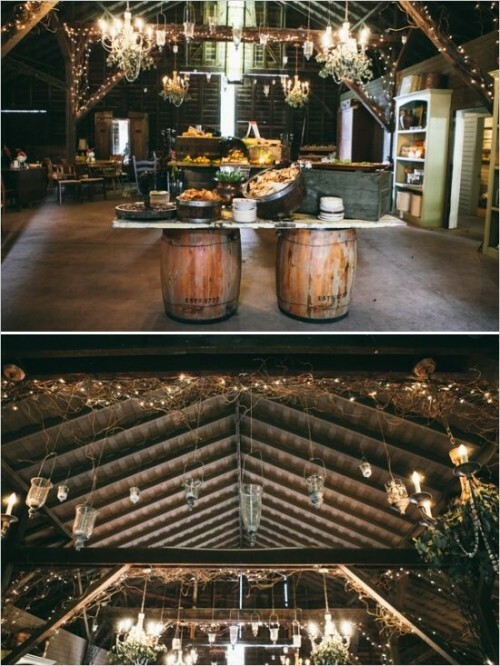 I seriously adore everything about this picture, and it’s a MUST for country rustic! If you grew up in the country, you know the unconditional love you have for your precious horses. They instantly make you smile and brighten up your life, even when they throw you 10 feet into the air for really no good reason at all. That’s true love. And in the spirit of “true love”, why not bring something you love to your wedding? 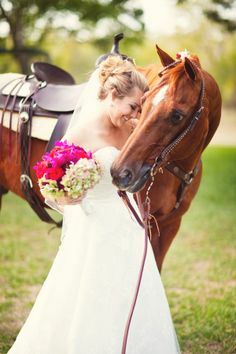 Add your horse to the wedding to really bring out the country feel, or (just like the Ford pickup truck) just take lovely, breathtaking photos with your beloved horse like the picture you see above. Gorgeous! 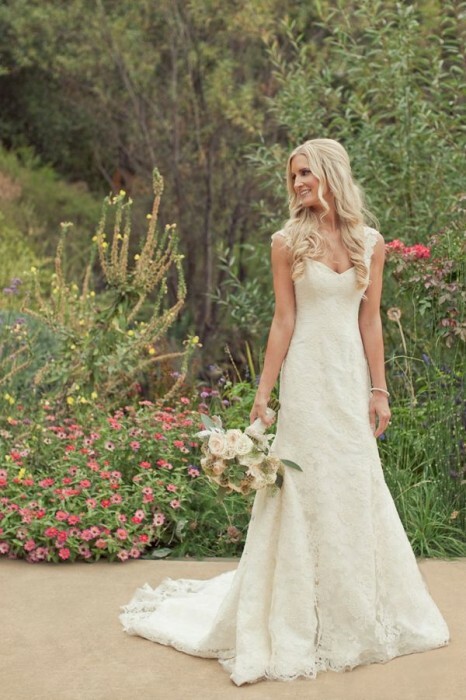 A rustic country wedding dress is typically an off-white color, some even diving into beige. It’s adorned with plenty of lovely and feminine lacing, and comes with an elegant train that isn’t too overwhelming or over-the-top; just simple and chic, like everything else in a country girl’s life. When a country girl doesn’t have her hair pulled back into a ponytail so she can ride her horses along the countryside, she’s undoubtedly primping her hair up with plenty of curls and volume. And this is especially true for her big wedding day. 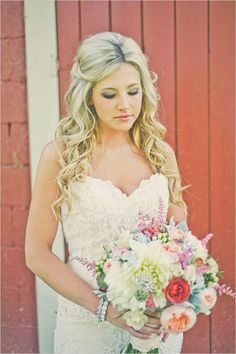 The half updo is an incredibly popular hairdo amongst country gals, and it’s a must to match up with her gorgeous rustic country wedding dress. So when it comes to the hairstyle, don’t think twice. All you need is three things: volume, curls, and a pin to pull it back into a half updo. A bride is nothing without her wonderful bridesmaids, right? 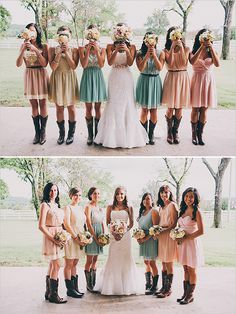 When it comes to choosing the perfect bridesmaids dresses for a country rustic wedding, there’s really only three color to consider: a pale pink, light beige, or soft teal. As far as style goes, keeping it simple and chic is key- short dresses that fall to the knees and either strapless or thick shoulder straps- and a pair of country boots to match. Flower girls are always adorable, but come on- is this not the cutest thing you have EVER seen? 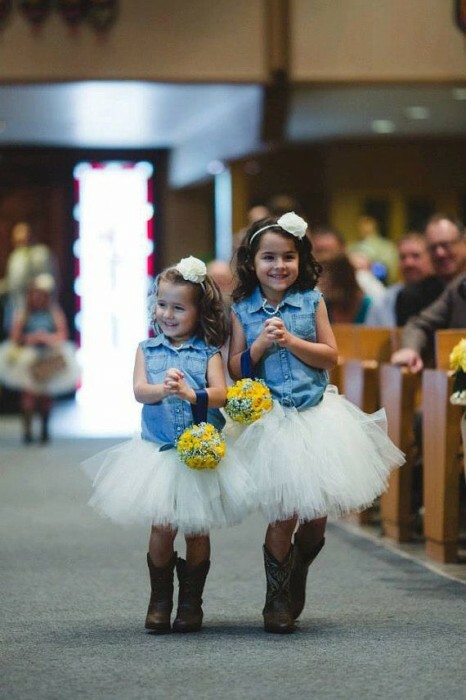 Your flower girls need to showcase that country girl look too, and it’s never been easier than with this cute combination of jean vests, white tutus, and cowboy boots to match. LOVE IT! When it comes to the flower bouquet, you want to stick with as many earthy tones as possible. We’re talking tans, beiges, and of course, greens of all colors and shades. To add a little dash of femininity and a pop of color, try throwing in a few other tones like pale pinks and light purples/lavenders. One of the most important aspects of a wedding (aside from the wedding dress and rings, of course) is the location. The location will really set the theme and the tone for the entire wedding, so choosing the right spot is of utmost importance. That being said, what better place to throw a rustic country wedding than a barn? It’s perfect. It obviously has the country feel without any added decoration or music, making it a quick and easy option. 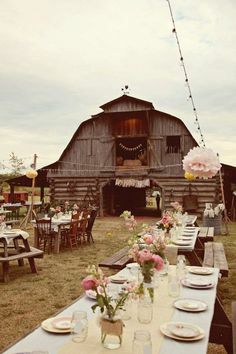 However, if you’re not able to get your hands on a barn for your wedding, the next best choice is to throw an outdoor wedding where you can have hay bales for seats and throw up plenty of other decorations to create the perfect country atmosphere. As with any wedding, you have to set the mood for the occasion, and that’s where decorations come into play. You want your guests to feel like they’re out in the middle of the countryside, with nothing but nature, peace of mind, relaxation, and of course good times. Your decorations should fulfill their hearts with the spirit of the country, and you can do that by applying decorations throughout the entire venue. Chandeliers are a huge hit in the country world, and if you find a way to add that into your wedding decor, you ABSOLUTELY should. 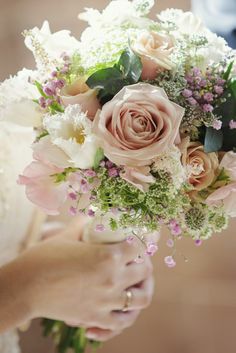 Other things you should add: some beautiful flowers and greenery, tablecloths with earthy tones and if you can, lots of lace, a centerpiece of flowers (that should be close to matching your bouquet), and some other finer details like chic wine glasses, mason jars, and dinnerware to fit the occasion. Feel free to add any country decor you may already own too, like homemade welcome signs made from wood or rustic candles. You want to submerge your guests in the country theme from the moment they walk in the door. 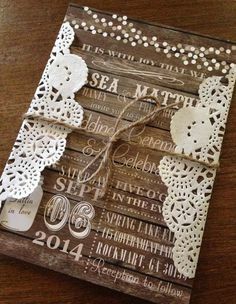 That being said, your guestbook should have the country rustic theme as well. We love this idea of using a chunk of wood to have your guests write on, it’s super rustic and totally country chic. However, you could always use a traditional guestbook in country colors and add a few decorations like flowers in a boot and a candle nearby. Lots of options! Your guests need to know you’re throwing a country rustic wedding before they arrive, right? What better way to introduce your theme and give them an idea for their attire than by inviting them with a classic country rustic invitation. We ADORE this invitation- it’s the perfect combination of rustic, vintage, and country, complete with a “wood” background, chic lettering, and accents of lacing to complete the look. Absolutely in awe of this adorable chic wedding invitation! So you’ve invited them with a rustic theme and you gave them a full-on country wedding they will remember for the rest of their lives- now what? You don’t want them to go home without a little chunk of your country wedding, right? That’s where the wedding guest favors come into play. We love this mason jar idea- it’s cute, simple, and super country. Add their names and a little tag saying “Thank you!”. Leave them empty or fill them up with honey, homemade jams, or ingredients to make their own S’mores! A country wedding only needs one kind of food: BARBECUE! So fire up those grills, boys- we are going to need a LOT of barbecued foods like steaks, hamburgers, corn, baked beans, green beans, and so much more. Oh, and by the way, we absolutely LOVE the idea of placing the food on top of barrels. How ridiculously country rustic is that?! A wonderful idea for presenting your delicious barbecue! I’m not trying to stereotype here, but I know a lot of country guys and gals like to drink. 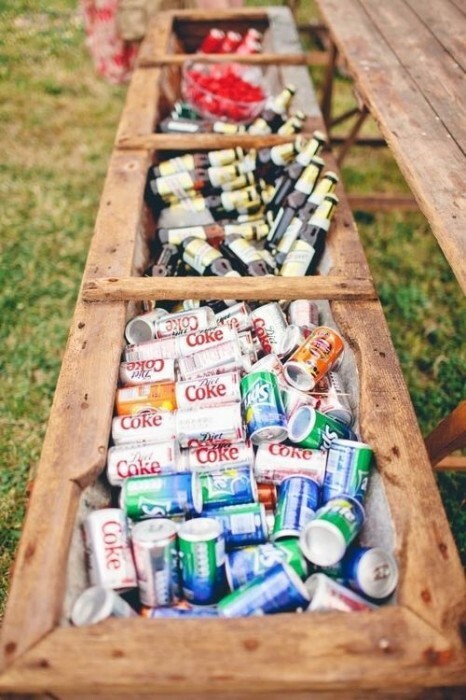 And if your country rustic wedding is planning to be equipped with a bar, you need to know what to serve and how to serve it. First and foremost, you need hard liquor like whiskey and bourbon. And while some may take it straight up, you should still have some coke for mixing. As far as beer goes, any American or dark beer should do the trick (or whatever you want to serve!). The options are limitless. And as for presentation? 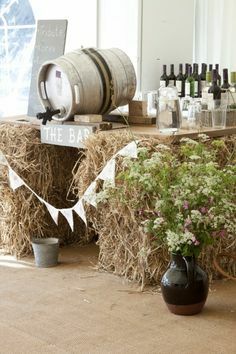 Well, this serving station with hay and a keg is the absolute perfect bar for a rustic country wedding. When you think of the country, you think of large plains, farms, horses, cowboy boots, and of course, the sweet scent of homemade pies filling the air around you. So, why not serve some yummy homemade pies at your wedding? 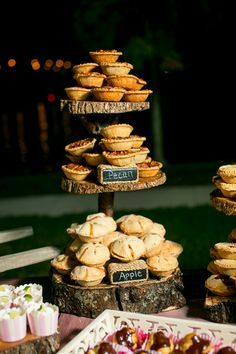 We love these mini pies because they’re easy for your guests to grab and won’t require and prying or cutting or extra plates. 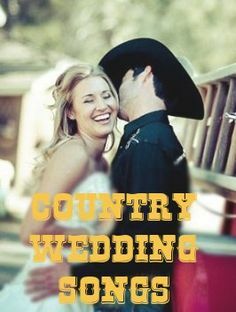 An excellent option for a country wedding! You could also throw in some candy apples and cupcakes decorated with frosting that matches the colors of your event. Aside from the bride, one thing everyone looks forward to seeing at a wedding is the wedding cake. But what kind of cake is perfect for a rustic country wedding? The keyword to remember is simplicity. You want a subtle cake like the one shown here, all white with a few accents of beige and a little bit of frills for that feminine country chic flavor. 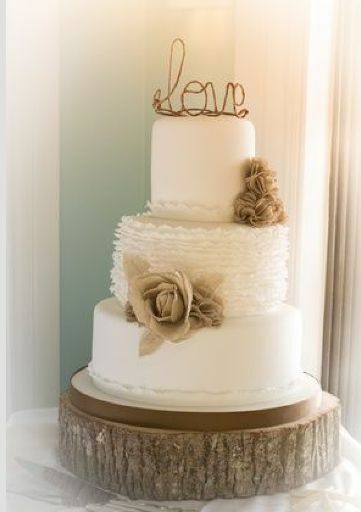 As an added country bonus, try placing your cake on top of a piece of wood like they’ve done in this picture. Extra country points with that one! This is totally an awesome idea. I mean, a drink station that’s made to look like a trough? How country is that!? Really, we can’t get over what an amazing idea this is. Plus it makes it easy for your guests to walk up and grab a drink they want. Perfect! You will NEVER guess what kind of music you should play at your rustic country wedding. Yeah, that’s right. Country music! Play your favorite hits and enjoy the night from hit artists like Tim McGraw, Rascal Flatts, Anne Murray, Shania Twain, Kenny Chesney, Faith Hill, Brad Paisley, and Keith Urban! Your wedding should have pictures from head to toe showcasing the love you and your husband/wife to be have. But since you don’t want to completely irritate your guests with an overflow of adorable cutesy pictures, we have a better idea: showcase them in a classy, fun, and totally country way. 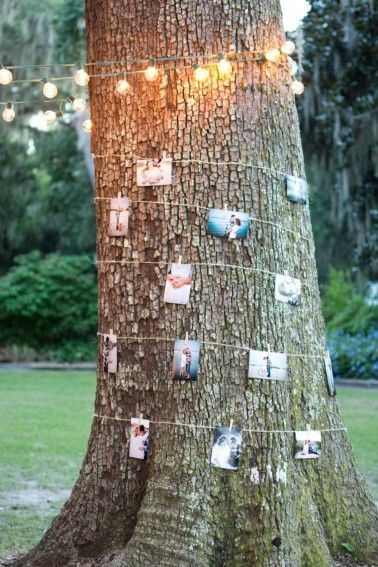 There’s lots of ways to do this, but we particularly fell in love with the idea of hanging a string of pictures around a tree. Super cute and totally country! We already listed tons of adorable decorations for your wedding, but there’s always those cute accents you don’t see at every wedding. 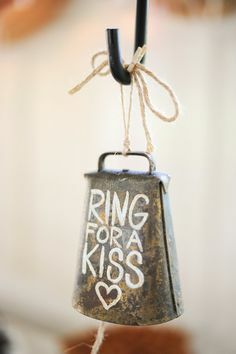 Take this for example: the bell is rustic and country, and the idea is as adorable as it gets. Every time someone rings the bell, the couple has to kiss. 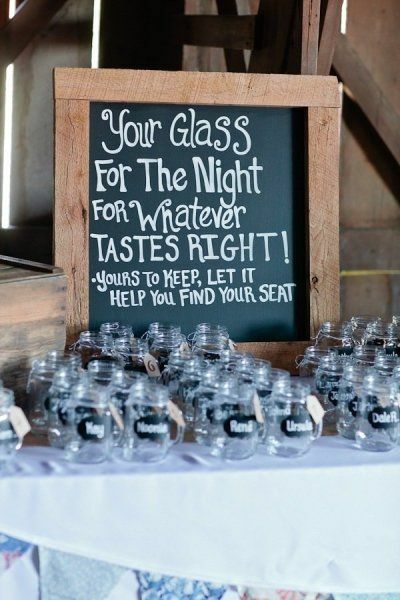 That’s just one of many cute accents you can add to your country wedding to really spice things up! 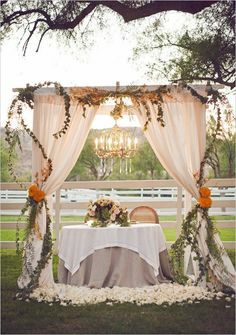 What’s your favorite rustic country wedding idea?